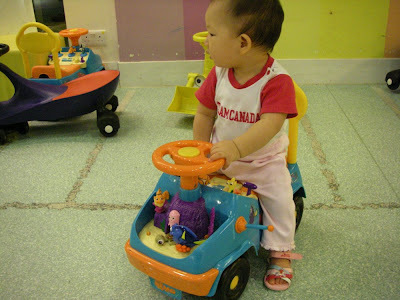 With her enrollment in Kindermusic, Natalie also has unlimited access to the play area downstairs in the QQ Club Center. It's sooo convenient because it's located literally just downstairs from us. She goes at least once every week to hang out and play with the toys there. 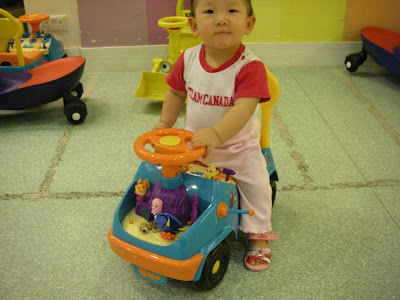 They mainly have lots of toy cars (like those pictured below) and a reading center with lots and lots of books. The books are mainly the paper variety though, and we don't trust Natalie to quietly read them without (accidentally, of course) tearing out a few pages here and there, so for now, she really enjoys playing with the more durable cars; walking and pushing them around, and sitting on them and checking out all the little buttons and knick-knacks and do-dads. 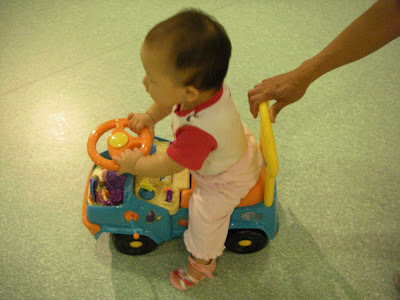 See Video 121 of Natalie walking while pushing the car. She pushes it for a little bit and then I think she wants to sit down on it, but can't figure out how, so instead, she pushes it back the other way. In the end, we help her back on and she plays with the buttons for a while. Below are pictures of Natalie on her current favourite car.